A collection of links to websites related to birding. Membership in the ABA will take you further along your own personal birding journey. Our publications, web resources, and events have much to offer anyone with an active interest in birding, whether you like to stay close to home, or to wander the globe, or a bit of both. In Texas, we depend on water. Across the state, we live with a complex network of waters that connects our communities - ranging from our 80,000 miles of bayous, rivers and streams to our countless acres of wetlands. Baytown Nature Center, located at 6213 Bayway Drive, is a 500-acre peninsula surrounded by Burnet, Crystal and Scott Bays. It consists of hardwood uplands, high quality tidal marsh, and freshwater wetlands. This unique site is listed on the Great Texas Coastal Birding Trail, providing habitat for 317 species of resident and neo-tropical migrant birds. The American Bird Conservancy designated BNC as a nationally important bird area. The nature center hosts a monthly Audubon Bird Survey in partnership with Houston Audubon. But this recreated wetland isn't just for the birds. Numerous other animals also call the nature center home. In addition, it's an important nursery area for a variety of aquatic species, including shrimp, crab and fish. If you're an avid birder, or simply a beginner looking to get started, you've come to the right place! Beaumont, Texas is located near the Gulf of Mexico, known for its globally unique ecosystem with a diversity of habitats, fish and wildlife. Gulf habitats are essential to the annual cycles of many species of breeding, wintering and migrating waterfowl, wading birds, shorebirds and songbirds. . In addition, Beaumont is bordered by the Pineywoods of East Texas where over 350 species of birds are spotted annually. Big Bend National Park is the most bio-diverse park in the entire system. Within its boundaries, one finds more species of butterflies, bats, reptiles, plants, ants and birds. Over 450 avian species either live in Big Bend National Park, or migrate through at some point in the year. The variety of habitat with desert mountain and river makes for ideal conditions for a truly remarkable diversity. Audubon Texas and Texas Parks and Wildlife Department are pleased to announce the Bird City Texas certification program. Bird City Texas recognizes and encourages effective and impactful native bird conservation where people live, work, and recreate. Join Marc & Eliana's epic road quest from Florida to Alaska in 2018 as they traverse the wild spaces of North America in search of birds, nature, and adventure. Throw in a wedding and a trip to Attu and you’ve got the journey of a lifetime! The Birding Community E-Bulletin is an email newsletter concerning birds, birding and bird conservation. Coedited by Paul Bausch and Wayne Petersen, the newsletter is distributed by email at the start of each month and is intended to keep friends and associates abreast of important bird, birding and bird conservation news. Kristine Rivers loves sharing her passion for nature and wildlife with others, and founded Birding for Fun in 2015 to provide educational services, field trips and guided tours, and offer select products to the public. She is available for speaking engagements for your organization, and can develop workshops and field trips or guided tours specific to your needs. Tropical Birding Tours provides free guides to the Houston Audubon Society over the spring birding season at High Island Texas. Weather private groups or organized tours from other companies, we disseminate the information so that everyone who visits High Island, Bolivar Peninsula and Anahuac NWR get the very most this amazing place has to offer. Every year during March and April, EarthQuest brings the Birds of Prey program to Brazoria County for Migration Celebration. During the weeks preceding Migration Celebration, EarthQuest's wildlife handlers present Birds of Prey programs in more than 30 schools in the Alvin, Angleton, Bay City, Brazosport, Columbia-Brazoria, Damon, Danbury, Sweeny, and Van Vleck School Districts, reaching a total audience of over 15,000 students and teachers. We here at BirdsEye are fanatics for supporting citizen science projects. Our goal is to advance projects that we think have got it right– projects that are collecting great and usable data, are helping interested volunteers contribute their sightings, and moving the ball forward in conserving species. From miles of sandy beaches, pristine bays and bayous, to bottomland hardwood forests, come experience the diverse and beautiful landscapes that Brazoria County has to offer. There's great fishing, camping, paddling, and birding - all of which you can find within Brazoria County Parks. Nature has top billing at this park. Be sure to bring your walking shoes, binoculars and camera. Besides marveling at nature, you can also hike and bike, fish, picnic, geocache, ride your horse, and stay over­night. Reserve one of our picnic pavilions or our group hall for your next group gathering. Pay due respect to alligators, which are common in some areas of the park. Read our alligator safety tips before you come. Explore on foot, bike, or horseback. We have 37 miles of trails, some of which are wheelchair-friendly. Brazosport Birders is an organization founded in 1977 that is based in southern Brazoria County, whose primary focus is birding and conservation of our natural resources. Meetings are held at 7:00 PM at Gulf Coast Bird Observatory, 299 Hwy 332 West, Lake Jackson on the 4th Monday of September, November, January, March, May. Meetings are open to the public. Don't worry about skill levels. We are a collection of novice to very experienced birders and naturalists. We welcome everyone to join us. Houston Audubon is a regional nonprofit conservation, education and advocacy organization that focuses on protecting the natural environment for birds and people. A significant part of our work is owning and managing nature sanctuaries to protect habitat for birds and provide people recreational opportunities in nature. We were accredited as a land trust in July 2017. Our strategic plan states "The flight and song we nurture today defines the quality of life and sense of place we share tomorrow. Houston Audubon aims to inspire a culture of conservation and a way of life that allows us to thrive in harmony with nature. Our vision is the creation of a healthier, more beautiful place to live by leading and nurturing a community that values and supports birds." At the Cornell Lab of Ornithology, scientists, conservationists, engineers, educators, and students all work together for a common purpose: to understand birds and other wildlife, to involve the public in scientific discovery, and to use our knowledge to protect our planet. Our mission: To interpret and conserve the earth's biological diversity through research, education, and citizen science focused on birds. Black skimmers are in a group of birds called colonial waterbirds that include species such as great blue herons, least terns, and snowy egrets. Colonial waterbirds nest in large and often mixed groups probably as a way of defending their nesting sites against predators. Black skimmers nest on sandbars, beaches, and shell banks. They need a nesting site relatively safe from predators and human disturbance. Dow provides such a site. The Federal Duck Stamp is an adhesive stamp issued by the United States federal government that must be purchased prior to hunting for migratory waterfowl such as ducks and geese. For nearly 85 years, by buying Duck Stamps, waterfowl hunters have supported the conservation of more than 5.7 million acres of strategic wetland habitat. Ninety-eight percent of the purchase price of the stamp goes directly to buy and lease wetland habitat on national wildlife refuges. EarthQuest is a non-profit environmental education organization, dedicated to the education of the public as to their impact on the natural world. The concept for EarthQuest began in the Spring of 1989 as an idea to educate the general public about wildlife through the presentation of live animals in an entertaining format. Bird watching is a time-honored tradition that many people enjoy today. Don't worry, you don't need any special equipment to go bird watching, and you certainly don't need to travel to exotic locations. Simply sitting in your backyard and watching the birds local to your area is all it takes to engage in the hobby. If you're on the fence about whether or not you should take up this fascinating hobby here are eight benefits of bird watching that should help you make your decision. Thousands of birds take wing to our island each spring during an arduous northward migration across the Gulf from Central and South America. And hundreds of tourists and neighbors follow suit to see more than 200 species of brightly-colored birds strut their stuff around our hometown — a prime location along the Great Texas Coastal Birding Trail. FeatherFest is a fun four days of excellent birding and nature photography workshops and adventurous field trips. Galveston Island is one of the top locations in the country for birding It has a rich variety of habitats – beaches, wetlands, grasslands, woods, ponds, and bays – in a small area that are home to many common year-round species, as well as numerous others that visit briefly or for part of the year. The Great Texas Coastal Birding Trail is a state-designated system of trails, bird sanctuaries, and nature preserves along the entire length of the Texas Gulf Coast in the United States. As the state of Texas hosts more bird species than any other in the U.S. the trail system offers some of the most unusual opportunities for bird-watching in the world. The "trail" is actually 43 separate hiking and driving trails that include 308 birding sites. The sites themselves feature a variety of viewing opportunities with boardwalks, observation decks, and other amenities. The trails boast more than 450 bird species. The trail system is managed by the Texas Parks and Wildlife Department as part of the Great Texas Wildlife Trails which also include the Heart of Texas Wildlife Trail, the Panhandle Plains Wildlife Trail, and the Prairies and Pineywoods Wildlife Trail. (Wikipedia). Gulf Coast Bird Observatory is an independent non-profit organization with 501(c) status. We have become recognized as an innovative organization, which has designed and conducted a significant number of large conservation projects, including migration studies, habitat enhancement, land acquisition, regional habitat mapping, and others. Gulf Coast Wildlife Rescue is a tax-exempt non-profit organization of permitted wildlife rehabilitators and volunteers dedicated to caring for injured and orphaned wildlife for the purpose of release back into the wild. The primary activity of GCWR is to provide food, shelter, medical treatment, and rehabilitation to all Texas native wildlife at no cost to the public. We serve the Brazoria and Matagorda County areas along the upper Texas Gulf Coast. GCWR is an all volunteer organization with no paid employees. HawkWatch International is a non-profit organization that works to protect raptors and our shared environment through scientific research and public education. As a non-advocacy group, we tackle the issues one at a time by looking at the latest data to balance smart development and the need for conservation. The mission of HawkWatch International is to conserve our environment through education, long-term monitoring, and scientific research on raptors as indicators of ecosystem health. Massive oil spills often make headlines because of their destructive impact on wildlife and the environment. What many people don't realize, however, is that even a small amount of oil, no more than a dime-sized drop, can be deadly to birds. Understanding how oil affects birds can raise awareness of just how hazardous any oil spill or similar pollution can be. Since 1971, International Bird Rescue (IBR) has provided oiled wildlife collection, rehabilitation and documentation services on an assured basis for companies that transport or hold petroleum products. The appropriate state, provincial and federal resource trustees direct these services under agreed-upon criteria. In the U.S., the Oil Pollution Act (OPA) mandates wildlife response during oil spills and a successful response requires professional, trained wildlife responders work within an incident management team using a contingency plan based on real world experience. Thanks for visiting the website of Kathy Adams Clark and KAC Productions. You'll find information about photography classes, photography workshops, international photo tours, stock images, and writing projects. Bird watching, also known as birding, is considered a hobby by some and a sport by others, but it can also be a great activity for kids. It is one of the most popular hobbies in that it embraces a large group of people of all ages. About one-fifth of the United States population is thought to be involved in bird watching, according to the United States Fish and Wildlife Service. One of the reasons for the popularity of bird watching is that there are no special requirements in order to participate. At Lake Livingston State Park, you can swim, fish, boat, hike, bird, camp, picnic, mountain bike, geocache, and study nature. We have activities for the whole family! We offer many camping options, from tent sites with water nearby up to campsites with full hookups. You can also rent one of ten screened shelters, some of which are ADA accessible. Or book one of our group facilities for your next reunion. Our Mission: to connect people, birds and nature; to celebrate the diversity of regional bird species as evidenced by Audubon's Christmas Bird Count; to create active involvement in science and art; and to encourage awareness and stewardship of the Matagorda Bay ecosystem. The Matagorda County Birding Nature Center (MCBNC) covers 34 beautiful acres and is located on the Colorado River in Bay City, Texas The Matagorda County Birding Nature Center covers 34 beautiful acres and is located on the Colorado River in Bay City, Texas. MCBNC has six botanical gardens and three major ecosystems to enjoy. We offer outdoor experiences for people with a passion for nature. People who enjoy gardening, native plants or wildlife can follow a self-guided tour through a butterfly, hummingbird, rose, herb, cactus or palm and bamboo garden. MCBNC has six botanical gardens and three major eco-systems to enjoy. We offer outdoor experiences for people with a passion for nature. People who enjoy gardening, native plants or wildlife can follow a self-guided tour through a butterfly, hummingbird, rose, herb, cactus or palm and bamboo garden. At one time or another, everyone asks the question, "What is that bird?" Finding the answer can be remarkably challenging. Part of the mission of the Cornell Lab of Ornithology is to help people find that answer. We know it is hard to figure out the name of the bird you saw when sorting through a massive field guide, using search engines, and other resources. Merlin is designed to be a birding coach for beginning and intermediate bird watchers. Merlin asks you the same questions that an expert birder would ask to help solve a mystery bird sighting. Date and location are Merlin’s first and most important questions. It takes years of experience in the field to know what species are expected at a given location and date. Merlin shares this this knowledge with you based on more than 200 million sightings submitted to eBird from birders across the United States and Canada. 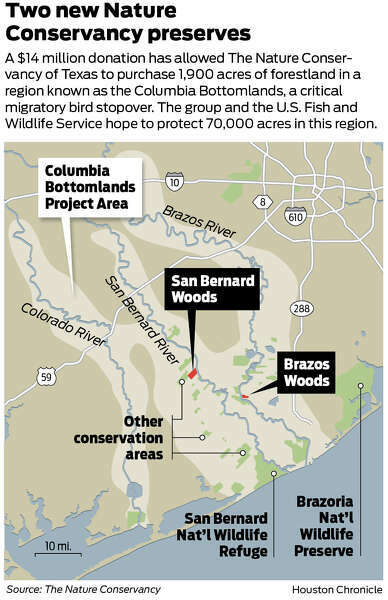 Friends of Brazoria Wildlife Refuges is a non-profit organization dedicated to supporting the Brazoria, San Bernard, and Big Boggy National Wildlife Refuges. FOBWR raises funding through donations, grants, and gifts. We help fund wildlife refuge projects, educational programs, and other activities. Our goals for Migration Celebration are to educate the public on wildlife and habitat conservation; to bring awareness to the community of the local wildlife refuges; and to involve local organizations and business in bringing environmental education programs to schools. The National Audubon Society protects birds and the places they need, today and tomorrow, throughout the Americas using science, advocacy, education, and on-the-ground conservation. Audubon's state programs, nature centers, chapters, and partners have an unparalleled wingspan that reaches millions of people each year to inform, inspire, and unite diverse communities in conservation action. The National Wildlife Refuge Association's mission is to conserve America's wildlife heritage for future generations through strategic programs that protect and enhance the National Wildlife Refuge System and the landscapes beyond its boundaries. If you travel much in the wilder sections of our country, sooner or later you are likely to meet the sign of the flying goose-the emblem of the National Wildlife Refuges. You may meet it by the side of a road crossing miles of flat prairie in the middle West, or in the hot deserts of the Southwest. You may meet it by some mountain lake, or as you push your boat through the winding salty creeks of a coastal marsh. You may meet it by the side of a road crossing miles of flat prairie in the middle West, or in the hot deserts of the Southwest. You may meet it by some mountain lake, or as you push your boat through the winding salty creeks of a coastal marsh. Wherever you meet this sign, respect it. It means that the land behind the sign has been dedicated by the American people to preserving, for themselves and their children, as much of our native wildlife as can be retained along with our modern civilization. The Nature Conservancy is tackling some of the toughest problems facing people and nature today, replicating good ideas to save many places and improve people's lives. We are grounded by local experience and leverage our science, real-world solutions and partnerships to influence global decision-making. Every acre we protect, every river mile restored, every species brought back from the brink, begins with you. • San Bernard Woods Preserve. Four schools have opened in New England since 1996 to teach about falconry — a form of hunting that's more than 5,000 years old. If you are passionate about birdwatching, backyard birds, or just enjoy looking at pretty nature pictures and learning about the United States, this infographic about U.S. state birds is sure to please. The tradition of selecting state birds began in 1927, with Alabama, Florida, Maine, Missouri, Oregon, Texas, and Wyoming being the first to select their state birds. While many states have individual birds, the Northern Cardinal represents seven states, and the Western Meadowlark represents six states. On the state birds map, you will notice interesting trends from the Eastern coastline to the West. Have you ever spotted or heard your state’s official bird? Each one has a distinct bird song or call that can help you identify it. The biodiversity within the United States is truly marvelous and fun to study. This is a small bird sanctuary, managed by the Gulf Coast Bird Observatory, on the Upper Texas Coast, close to the towns of Freeport and Lake Jackson. It is part of the Great Texas Coastal Birding Trail. In the Spring and Fall it attracts neotropical migrants. According to a new study, all perching bird species—the majority of the world's bird population—originated in Australia. These perching birds—called passerines—make up more than 60 percent of all birds. There are more than 6,000 species of passerines—distinguished from other birds by the arrangement of their toes (three pointing forward and one back), which facilitates perching—including familiar birds like cardinals, warblers, jays, and sparrows. Texas has some of the best birding in the world, boasting 649 species, many of which can only be found in the Lone Star State. So grab your binoculars, get out, and join the fun! Beginning and experienced birders alike are invited to attend the community events below and increase their life list. Birding, enjoying the beauty of not only the colors and shapes but also the behaviors and sound of birds around us, is one of the fastest growing pastimes in North America – and Texans have a lot of birds that we can enjoy across the Lone Star State.&nsp; From the beautiful, aerobatic and feisty hummingbirds that dart back and forth around the beautiful flowers of our gardens, to the silent owls patrolling our forests and field, Texas is by far the most bird diverse state in the nation. Invasive Species are non-native species of animals, plants, and pathogens whose introduction causes economic or environmental harm in their newly acquired ecosystem. Their economic damage can cause a loss of millions of dollars. Non-indigenous species are species that through human influence occurs outside of its native range. The thunder of 40,000 snow geese taking flight, the salty breeze off the Texas Gulf, or the sight of a 12-foot alligator loafing on a muddy bank make a trip to Texas Mid-Coast National Wildlife Refuge Complex a sensory banquet in any season. Three national wildlife refuges form a vital complex of coastal wetlands harboring more than 300 bird species. They serve as an end point of the Central Flyway for waterfowl in winter, and an entry point for neotropical migratory songbirds tired from a 600-mile Gulf crossing from Mexico's Yucatan Peninsula. Located just south of Houston, the refuge complex offers haven for both wildlife and people. The Houston area is one of the most heavily-visited birding areas in the world with people flying in from all over sometimes just to take a bird tour, get back on the plane, and head to their next destination.ding Sites Around Houston. Travel Texas' mission is to enhance and extend local economic development efforts by marketing Texas as a tourist destination in out-of-state domestic and international markets, thereby generating non-Texan travel to the state and ultimately creating revenue and jobs. Travel Texas provides a truly integrated marketing effort. The functions and services of each of the three interrelated program areas—advertising, public relations, and travel research/development—support Travel Texas' overall mission. Tropical Birding offers two distinct types of photography tours: On a Photo Tour, we often concentrate on very specific targets and spend a lot of time with them, trying to get superb-quality photos. Seeing large numbers of species takes a back seat to getting awesome shots. On a Birding With A Camera Tour (BwC), we try to see lots of birds and other animals, but also spend more time photographing them than we would on a traditional birding tour. We are the U.S. Fish and Wildlife Service, charged with protecting and enhancing America's treasured fish, wildlife, plants, and their habitats. We work for the perpetuation of diverse and abundant wildlife because biodiversity is essential to maintaining the health of our environment, our families, and our economy. We maintain a network of public lands totaling upwards of 150 million acres. Whatbird.com lets you find your bird with just a few clicks by presenting a visual interface to whatever field mark you select first. Each step narrows the search results to help locate the bird you saw. Try the bird search engine--it currently has over 900 birds in the database, each having a magnificent hand painted illustration, a bird call (the sounds it makes) that you can listen to and extensive species accounts. Based in Homer, Alaska, we specialize in crafting birding and ecotourism adventures designed for those in search of birds, wildlife, and wild places. Specializing in remote destinations, unique experiences, and wilderness travel, Wilderness Birding Adventures (WBA) has been the company of choice for those seeking to bird Alaska with Alaskans.. With the most complete selection of birding trips offered in Alaska, we welcome novice and experienced birders alike, and are happy to assist you in finding your dream trip. . If you enjoy observing and learning about birds, wildlife, landscapes, and fascinating places then you’ll love our trips.. From a remote base camp in the Arctic National Wildlife Refuge to serious birding tours on a Bering Sea island, we design and deliver impeccably organized and professionally guided trips to Alaska’s birding hotspots and to its little known hideaways. During this two-day event, experienced guides will lead you on field trips to Cheyenne Bottoms and Quivira National Wildlife Refuge during peak shorebird migration, a time when thousands of shorebirds and up to 1/4 million waterfowl visit the area! Greater prairie chicken viewing opportunities will also be available.